Garvin’s Sewer Service began in 1940 as Denver’s first professional drain-cleaning company. Began by Russell P. Garvin, Garvin’s was passed to his great-nephew, Kenneth Aston in 1992. Currently, Kenneth’s three daughters run the day-to-day operations, making it a 3rd generation company. Garvin’s spent several decades in the golden triangle district of Denver, near the Capital. In 2001, they had expanded greatly and moved operations to Englewood where they could have a warehouse for supplies and offices to fit the growing staff. Today, they have over 30 staff who service the greater Denver area including most areas within a one hour drive of Denver. Specializing in drain-cleaning, Garvin’s was one of the first companies to offer sewer scope services, which looks at the condition of the pipes with a sewer camera. We also employed leading industry practices for commercial applications of drain-cleaning such as the main-liner for lines over 6 feet in diameter; the Sewer Jetter, a high-pressure water machine that blasts through dirt, debris, grease, sand and more for commercial sewer service for restaurants, car washes, shopping centers and apartment complexes. Garvin’s believes in using products that are tried and true. We still use the same effective products as we always have. Roto-rooter© created a machine that we still use today that includes a tightly wound cable with large sharp blades that cut out roots and push debris through the line to clear clogs without the use of harsh environmental chemicals. Our service doesn’t hurt plants or wildlife or cause any caustic problems with metallic or plastic plumbing- a safe, effective and cost sensitive way for homeowners to maintain the life of their plumbing systems and the planet. Garvin’s Sewer Service, over our 75 years, has grown from its drain cleaning roots to now include full-service plumbing. Although a third of our business is still doing basic drain cleaning and sewer service, we also employ half a dozen service plumbers who perform services from replacing faucets, repairing leaks, winterization, water heater repair, water heater replacement, boiler repairs, gas line installation and other skilled work. Garvin’s is pleased to help our customers with all their plumbing needs. Give us a call today! Garvin’s is dedicated to bringing you the best drain cleaning service in Littleton. We’ve been hard at work in the Denver area for 75 years, and we’ve seen every problem imaginable. There are three reasons we’ve stuck around for so long. The Right Prices: When you’re having problems with your drains and sewer, you’re not quite thinking straight. Too many companies take advantage of the situation, but Garvin’s will never do that. 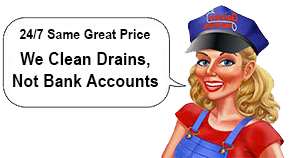 After all, we clean drains, not bank accounts! Speedy Service: When something is wrong with your drains, you don’t want to wait. We can get to you 24-hours a day, 7-days a week. Top-notch work: The best way to stay in business for as long as we have is to hire the right people. When you hire the best workers, you’re going to get your customers back again and again. Give Garvin’s a call at (303) 571-5114 for the best in drain cleaning services!